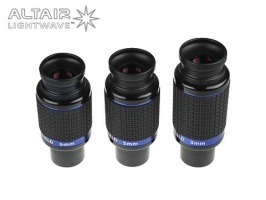 The Altair Lightwave Planetary Long Eye Relief Eyepiece delivers high power with a short focal length telescope, such as a small refractor, so it's ideal for high power planetary or lunar observing. 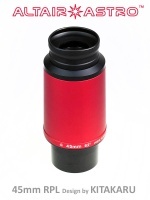 Altair Astro 25mm Kitakaru RPL Ortho Eyepiece 1.25"
Altair Astro 30mm Kitakaru RPL Ortho Eyepiece 2"
Altair Astro 45mm Kitakaru RPL Ortho Eyepiece 2"
The Altair Lightwave TM Premium Long Eye Relief eyepiece has a very flat, well corrected and wide 68° apparent field of view. 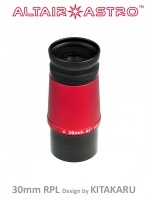 The 20mm Long Eye Relief means you can position your eye 20mm from the eyepiece lens, making this is a very comfortable eyepiece for beginners and experienced observers alike, whether or not you're wearing glasses.